Photo of some of the speakers at the event in Ashtown. 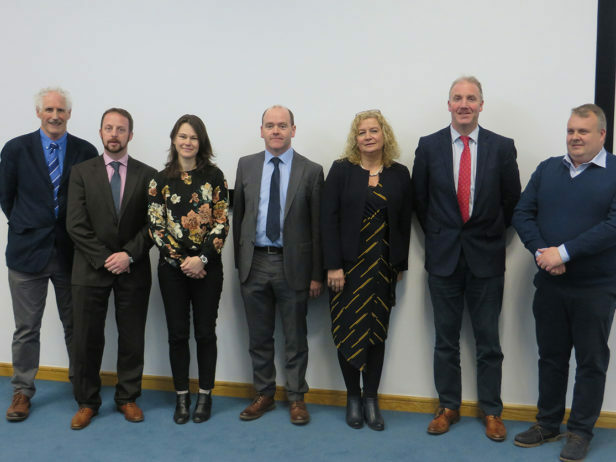 L-R Stephen Alexander, Teagasc; Paddy Phelan, 3CEA; Annabel Finnegan, DAFM; Dermot Callaghan, Teagasc; Michelle Kearney, DAFM; Barry Caslin, Teagasc; Tommy O’Shea (O’Shea Farms). A timely Energy 2019 event, targeted at horticultural growers, took place recently, Wednesday 3 April at Teagasc Ashtown, Dublin. The well-attended seminar, which attracted cross-sectoral support from the industry, was designed to inform, enlighten and encourage growers and stakeholders to improve energy efficiency on their holdings. Developing an understanding of renewable energy technologies and how they shape up as sustainable propositions were the main topics of the seminar. Michelle Kearney from the Department of Agriculture, Food and the Marine (DAFM) emphasised that increasing on-farm energy efficiency was part of the climate change challenge. Ireland has set itself the target of 16% of energy demand coming from renewables by 2020. Her Department is anxious to help the industry play its part in achieving this, by incentivising growers to invest in energy saving devices via the Grant Aid Scheme. The Sustainable Energy Authority of Ireland (SEAI) is also keen to assist through their SME Support Programme. Andrea Carroll stated that the average SME business can reduce its energy bill by up to 30% by implementing energy efficiency measures. The SME Lighting Upgrade Scheme 2019 aims to help growers upgrade their lighting to LED’s with a potential saving up to 60%; this can result in an average payback of 1-2 years. The latest scheme just out is EXCEED – growers can avail of a 50% grant to have an energy consultant examine their business for savings and a 30% follow up capital grant to implement the report’s findings. Paddy Phelan of the 3 Counties Energy Agency outlined the benefits of installing solar panels and pointed out that the Government are keen to encourage householders and farmers with recently announced grant schemes. However, connecting to the grid is more problematic and may require legislation to be changed. The virtues of the soon to be announced SSRH Renewable Heating Scheme were explained by Barry Caslin, the Energy Specialist in Teagasc. This is a government scheme administered by the SEAI and is to encourage existing oil and gas fired boilers to be switched over to a renewable fuel source such as woodchip. New investments will also be eligible for grant aid. Both solid biomass boilers and heat pumps are covered by the scheme. Tommy O’Shea of O’Shea Farms explained to the audience the measures taken on the farm to improve its environmental footprint by establishing reed beds and the steps taken to reduce waste and increase recycling. A major energy saving investment was commenced in October 2015 with the installation of 960 solar panels on their packhouse roofs. The electricity generated helps to power their refrigerated units with the surplus sold to the grid. The panels generate about 208,000 kW annually – enough to power up to 40 homes.